Fair warning: If you share this melty ham and pepperoncini sandwich with a friend, you'll probably be asked which deli you frequent. 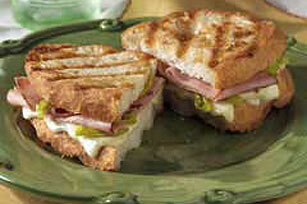 Fill bread slices with ham, peppers and cheese to make 2 sandwiches. Cook in nonstick skillet on medium heat 3 min. on each side or until cheese is melted and sandwiches are golden brown on both sides. For a more authentic panini sandwich, assemble sandwiches as directed. Place a weight, such as a smaller skillet or foil-wrapped brick, on top of each sandwich to flatten slightly as it cooks. Substitute MIRACLE WHIP Light Dressing for the light mayonnaise, and/or sliced banana peppers the pepperoncini peppers. Prepare using OSCAR MAYER Deli Fresh Smoked Turkey Breast or Smoked Ham.